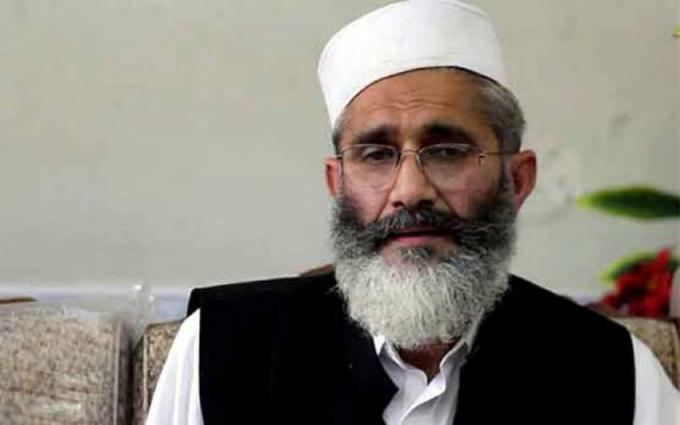 Islamabad (UrduPoint / Pakistan Point News / Online - 16th April, 2019) Ameer, Jamaat e Islami, Senator Siraj-ul- Haq has said that the 220 million Pakistanis were with the Kashmiris and India could not keep them as slaves by force.He was talking to the JI AJK's delegation which called on him here on Tuesday. The delegation was led by the deputy chief of the JI, Azad Kashmir, Raja Jehangir Khan. The delegation apprised the JI's Chief latest situation of human rights violation situation in Indian Held Kashmir.Siraj impressed upon the UN and the world community to play their role in the grant of the basic right of self determination. He said that India had been defeated in Kashmir and added that Indian Prime Minister Modi's extremism was pushing India towards creation of several Pakistans.He said that Kashmir is the issue of life and death for Pakistan and the Kashmiris struggle was for the completion of the incomplete agenda of the division of the sub continent. He said the Kashmiris struggle is in line with the UN Charter. He said that India itself had taken the Kashmir issue to the United Nations and the UN Security Council and promised to grant the Kashmiris the right of self determination. He said it was now the world community �s responsibility to bring India in the dock and compel her to grant this basic right to the Kashmiris.The JI chief said that if Islamabad had made a continuous struggle for the liberation of Kashmir under a long term policy, the Kashmiris would have been free by now. He said that peace in South Asian was closely linked to the solution of the Kashmir issue.He said that the colonial powers considered the Islamic movements as a challenge for themselves although Islamic movements were making s peaceful struggle for a real change by mobilizing the public opinion. He said that islam preached peace and love while the unrest in the world at present was due to the aggressive policies of the big powers.